With the release of "Gone Baby Gone" in 2007, Ben Affleck climbed from an agreeable actor with a battered professional reputation to an unexpectedly elegant filmmaker, interested in dramatic dark spaces and disturbing questions of morality, stewing in the juices of his beloved Boston. "The Town" finds Affleck in a more mainstream mood, mounting a stout crime thriller that spotlights the turmoil churning within a soulful, somber crook. Almost impossibly, Affleck generates a spellbinding pulse to the proceedings, constructing a magnificently exhaustive suspense piece that effectively mines the anxiety of criminal behavior and the bleak prison of home. With his partners in tow, Doug MacRay (Ben Affleck) leads a troubled life, successfully pulling off a string of bank and armor truck robberies around Boston, calling the criminal hot spot of Charleston his home. When one of the heists goes slightly askew, Doug's hotheaded partner James (Jeremy Renner) takes bank manager Claire (Rebecca Hall) hostage, soon releasing her once the coast is clear. Feeling guilt and attraction for the frightened woman, Doug attempts to develop a relationship with Claire, partially as a way to keep tabs on her, as F.B.I. forces, led by Frawley (John Hamm), move in to investigate. Falling in love, Doug considers a better life with Claire, but Charleston, with all of its insidious secrets and unfinished business, isn't ready to let him go. "Gone Baby Gone" was a more insular, reflective piece of thriller cinema, permitting Affleck an opportunity to build as a filmmaker without the crushing weight of a bloated budget or media expectations to distract from the business at hand. 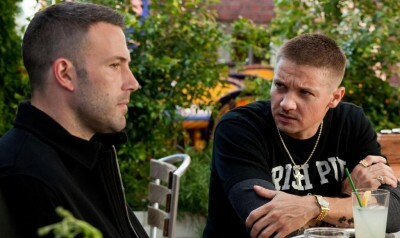 "The Town" inches Affleck up the industry ladder some, as the feature assumes a more commercial batting stance, exploring a blistered blue-collar community of broken dreams and criminal fortitude, with the primary goal of the picture grounded in more customary pieces of excitement, with numerous shoot-outs, explosions, and salted tough guy communication. However, "The Town" is not a greasy slide of formula, instead molded into something substantial in Affleck's capable hands. Boston is the spoiler here, with special attention paid to the brooding neighborhood of Charleston. Employing his knowledge of the area, Affleck instills "The Town" with local customs and heated attitudes, making the picture feel terrifically alert and lived-in. There's an ominous quality that permeates the frame, emerging from an awareness of the surroundings, with Affleck eschewing glossy locations to turn his Massachusetts backyard into a claustrophobic war zone, urging Doug to reconsider his vocation once the serenity of Claire enters his life. "The Town" holds to that verisimilitude tightly, keeping the Boston personality alive through vivid locations and characterizations, with dialogue often tearing into incomprehensible vernacular befitting this rough criminal brotherhood, underlining the uneasy bond between Doug and James. 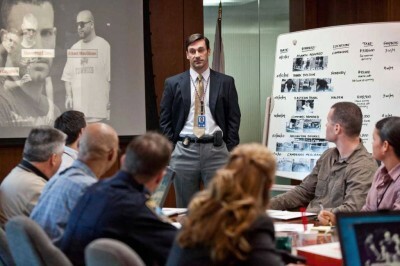 While neatly arranged with hostile acts of robbery (the boys don ghoulish disguises and attack with heavy weaponry to add nightmarish dimension to the sequences) and feverish law enforcement intervention (Hamm is effective as the government bloodhound), "The Town" slows down to survey the emotional disturbance at hand. Affleck is marvelous with his actors, permitting elements of tentative endearment and threat to create havoc in Doug's once deceptively simple life of crime. It's a measured directorial job that makes the most of the ensemble, with Affleck the director supporting Affleck the actor with a horde of expressive faces, creating a glorious pinball effect for the lead character. "The Town" saves the big bang for the finale, where Doug and the gang are ordered to loot the "Cathedral of Boston," complicating the crook's life to a point of implosion. It's a breathtaking, rattling closer, littered with spent bullet casings and bodies, concluding the picture with a dynamite show of force, barreling through the beating heart of the city. "The Town" is a menacing, gripping triumph from Ben Affleck, who finds a precise tone between introspection and extermination to launch a brutal tale of abortive destiny. It's a turbulent story explored with a steady hand, launching Affleck to the upper echelon of American filmmaking talent. It's a tense, terse, specialized triumph.